In this tribute to Selma Kramer, eminent child analyst and colleague and close friend of the late Margaret Mahler, senior analysts explore the continuing relevance of Mahler's separation-individuation theory to developmental and clinical issues. 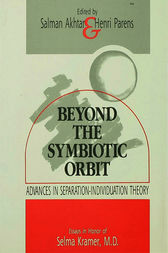 Editors Salman Akhtar and Henri Parens have grouped the original contributions to Beyond the Symbiotic Orbit into sections that reevaluate Mahler's theory. Section I is a timely reassessment of Mahler's working model from the standpoint of contemporary clinical and research findings. It includes comparisons of Mahler with Winnicott and Kohut, and commentaries on the status of separation-individuation theory in relation to psychosexual theory, early ego development, and observational infancy research. Section II addresses the contribution of separation-individuation theory to our understanding of pathogenesis. Neurosis, severe character pathology, psychosomatic phenomena, eating disorders, and sexual perversions are among the topics of specific chapters. The final section explores the role of separation-individuation theory in the treatment of analysands of different ages and with different kinds of psychopathology; it also considers separation-individuation theory with respect to specific aspects of the treatment process, including reconstruction, transference, and termination. A fresh reappraisal of a major perspective on early development, Beyond the Symbiotic Orbit is a fitting testimonial to Selma Kramer, who has played so important a role in elaborating Mahler's theory. Following from Kramer's own example, the contributors show how separation-individuation theory, in its ability to accomodate ongoing clinical and research findings, is subject to continuing growth and refinement. They not only advance our understanding of Mahler's working model, but pursue the implications of this model in new directions, underscoring the many areas of exploration that separation-individuation theory opens to us. "Beyond the Symbiotic Orbit is an extraordinary volume. Honoring Selma Kramer, an outstanding leader in child analysis and cherished friend of the late Margaret Mahler, it elaborates, refines, and extends Mahler's psychoanalytic perspective on early development. The chapters comprising this collection clearly illustrate the broad applicability of separation-individuation theory to psychoanalytic theory and technique, while maintaining an evenness of scholarship rarely found in edited books. It is a major work in the field, undoubtedly among the most thorough and accurate examinations of separation-individuation theory in its historical, theoretical, and clinical aspects. I highly recommend the book to analysts, psychiatrists, psychologists, social workers, and all those interested in child development and mental health." "If any one person should be credited with preserving the traditions of separation-individuation theory and conveying its essential meaning and relevance to mental health professionals, it is Selma Kramer, longstanding colleague and friend of Margaret Mahler, and now world-recognized authority on separation-individuation and early childhood development in general. It is altogether fitting, therefore, that this informative and inspiring volume, Beyond the Symbiotic Orbit, is published in her honor. The contributors are to be commended especially for realizing the promise of separation-individuation theory in its original form through innovative extensions of the theory informed by recent developmental and clinical findings. As each contributor illuminates a new facet of separation-individuation theory, so he or she enlightens the reader about the possibility of yet further applications to clinical and developmental theory, observational infancy research, understandings of child and adult psychopathology, and preventative interventions in natural settings." "This book indeed honors Selma Kramer and Margaret Mahler. It values Mahler's work by extending her contribution into new directions and applications. The editors have assembled outstanding papers on the theory and practice of separation-individuation processes that deserve our attention." Salman Akhtar, M.D., is a faculty member of the Philadelphia Psychoanalytic Institute, and Professor of Psychiatry and Human Behavior, Jefferson Medical College, Thomas Jefferson University. He is editor of New Psychiatric Syndromes: DSM-III and Beyond (1983) and coeditor of The Trauma of Transgression (1991). Henri Parens, M.D., is Training and Supervising Analyst, Philadelphia Psychoanalytic Institute, and Professor of Psychiatry and Human Behavior, Jefferson Medical College, Thomas Jefferson University. He is author of Dependence in Man (1971) and The Development of Aggression in Early Childhood (1979) and coauthor of Aggression in Our Children (1987).